The stakes are too high in 2020 for another charismatic, ideologically empty politician, standing for everything and nothing in particular, like Beto O'Rourke. Why exactly does anyone want Beto O’Rourke to run for president? It’s certainly not because of his legislative record, which is quite limited. Throughout six years in the House of Representatives, he passed three bills — two related to veterans affairs, one to renaming a federal building and courthouse. Nor does it seem to have much to do with any particular agenda he’s hoping to implement. Despite taking the odd progressive position here and there, O’Rourke is assiduously vague and slippery on policy specifics. As the Washington Post’s Jenna Johnson observed a few months ago: “When it comes to many of the biggest policy issues facing the country today, O’Rourke’s default stance is to call for a debate” — even when it comes to areas he himself is fond of emphasizing, such as border policy and immigration. A politician who wants things to get better. At long last. Given his general lack of legislative achievement, policy commitments, or distinct ideological edges of any kind, how exactly do we account for the Beto delirium that’s swept through certain quarters of the media and Democratic Party elite over the past few months (as well as the $6.1 million his campaign reportedly raised in its first twenty-four hours)? More than a few quite influential figures have pitched O’Rourke as a uniquely gifted politician, perfectly in sync with the times and primed to assume the mantle of political destiny. Pod Save America’s Dan Pfeiffer, for example, wrote last November that he’d “never seen a Senate candidate — including Obama in 2004 — inspire the sort of enthusiasm Beto did in this race,” concluding: “Millions of people already believe in Beto O’Rourke, and that moment, for them and him, may be upon us.” “He’s game changing,” said Robert Wolf, a past executive at the UBS investment bank who also happens to be a Democratic mega-donor. Such hyperbole (and much more in the same vein) aside, Beto-mania may have reached its zenith with last week’s fluffy, 8,500 word Vanity Fair profile — with a cover photo shot by Annie Leibovitz and timed perfectly for O’Rourke’s official campaign announcement. To return to the initial question then: why exactly do so many influential liberals believe Beto O’Rourke 2020 is a good idea? A partial answer is that O’Rourke reflects more or less the only presidential archetype Democrats have been able or willing to conjure since the Clintonite turn in the 1990s. Though material conditions for vast parts of their electoral base have continued to deteriorate, and though the country’s politics has in many respects continued to move rightward, personally charismatic Democrats with decidedly centrist politics have won the White House four times since 1992. Back in 2008, Barack Obama — by most measures, a far more talented politician than either Clinton or O’Rourke — ran and won as a kind of universal political cipher, rhetorically attacking special interests while also praising Ronald Reagan and pitching himself to the middle of the middle. He stood for everything and anything, and therefore nothing in particular — nothing, at least, that wasn’t already mostly acceptable to Washington’s conservative-minded policy consensus. Obama himself was quite conscious of it: “I serve as a blank screen on which people of vastly different political stripes project their own views,” he wrote in The Audacity of Hope. 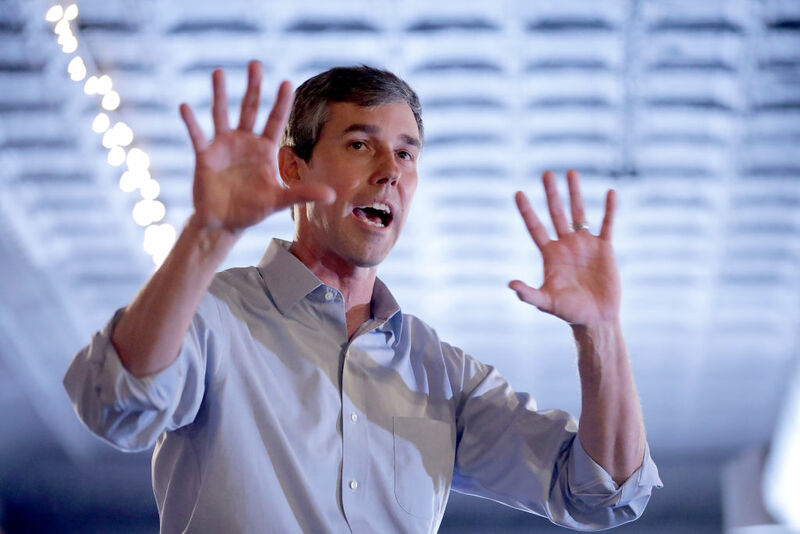 Lacking Obama’s compelling personal story and Clinton’s skillfully contrived folksiness, O’Rourke’s general pitch nevertheless has much in common with the one championed by the previous two Democratic presidents. If some elite liberals are trying to get the rest of us excited by O’Rourke’s candidacy, then, one reason is that it conforms so closely to the mold of politics with which they’re most familiar and comfortable — a politics which is avowedly about very little but nevertheless inspires tremendous fervor among the devoted. He is ideologically vague and deliberately so. He is politically ambidextrous, talking endlessly about the need for debate, compromise, bipartisanship, and reaching across the aisle. He combines high-minded sentiments about historical destiny with ethereal notions about hearing from all sides and taking seriously all points of view. O’Rourke is therefore as much a brand and a product as he is a prospective national leader: an unfolding cultural narrative in which to become emotionally invested for mostly apolitical reasons, like the question of which team will win the Super Bowl or who will finally sit on the Iron Throne at the end of season eight. Fronting for an all-too-conventional style of Beltway politics, his personality is a tabula rasa upon which sundry groups in the Democratic coalition are invited to inscribe most anything they please and see themselves reflected. If we are to go by Vanity Fair’s account, his cultural tastes usefully align with those of several key demographics and are squeaky clean with just a wee bit of #Edge. Most important of all, he is adept at seeming to say a whole lot while actually saying very little, trading in substance-free feel-goodisms with the smarmy bravado of an over-caffeinated self-help guru or door-to-door salesman — a quality admired above all others in the gilded, marketing-obsessed environment of Washington D.C.
For a privileged few, the 2020 presidential election may be just this: a notional spectacle whose stakes are so low that they can be communicated through appeals to mass-market fantasy. For the majority of Americans, though, the stakes are all too high, and there’s precious little time for another round of fan fiction.